Sven has a home! 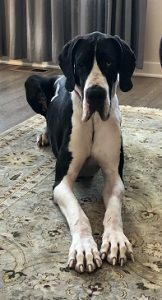 - Rocky Mountain Great Dane Rescue, Inc.
Sven has a home with his new family in Claremore OK! Mark and his wife Glenn, are 3rd time adopters from RMGDRI,having previously adopted Hera & Butterfly. The girls have fit so well into their new family life on the farm, and really love to play and explore. Butterfly keeps Hera on her toes with a passion for play, so Glenn thought Butterfly would benefit to have a playmate who can keep up with her. Sven was the perfect choice! He is a 2 year old with a lot of energy, and he loves to play! He also doesn’t like to be alone too much, and with Glenn being home most of the time, he will have constant love and attention. Sven will also share his new home with a sweet one year old pit mix named Bandit as well as horses, and a pig! We are so happy for this sweet boy! Way to go Sven!